The Project manufactures the stove from materials bought from Tanzanian merchants. Local craftsmen make the bricks, and the fire-resistant mortar is from a local recipe. To manufacture the stove’s firebox, we purchase steel sheets from dealers in Arusha and cut, bend, and weld in our factory in Monduli. We use tools and hand-driven machines from Dar es Salaam and Nairobi. Maasai women’s installation teams assemble the stoves in the homes of the customers. The teams lay bricks for the chimney, cut the hole through the roof, and mount the firebox. Together, the chimney and firebox successfully address the need to remove smoke, while keeping flame and after-burning smoke and gases engaged in the cooking process as long as possible. This stove design attains clear household air and high combustion efficiency. This reduces local deforestation and carbon emissions by 60 percent and relieves smoke in the houses by 90 percent. Each stove requires about 120 bricks. The women’s team levels the base of the stove and cuts the hole through the roof for the chimney. Around the firebox and where there is heat, we use a special heat-resistant mortar of sand, cement, and lime. The installers build the chimney alongside an interior wall. It is made of bricks with an udongo, or clay mortar. We use a cement and sand mortar where the chimney penetrates the roof and is exposed to moisture, attaching the final metal pipe and rain guard well above the thatch. 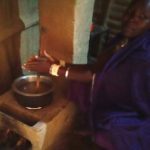 The stove is well suited to the needs of Maasai women. Pots of different shapes and sizes can fit well on the hole over the flames. The new, more efficient stoves require much less wood fuel than the traditional three-stone cooking fires. Women no longer need to collect the typical 100 kg of wood, but need only about 40 kg per week. This is a significant reduction in women’s menial labor load. In addition, the stove is very safe for children. They can sit right next to the stove or next to their mother while she cooks. The sides of the stove are not too hot to touch because of the insulating bricks cemented alongside the firebox. Women like to cover the sides of the stove with light colored mud which makes the stove even cooler to the touch. The women prefer stoves that are low to the floor, and they sit on short stools in front of the stoves as they cook. Stoves are built against the wall, and as soon as they have their new stove, the women clear out the old open fire that was in the center of the room to enjoy the new open floor space.